Western Whiskey Gazette (WWG): Identity Crisis? I received an email from a gentleman back east who was curious about the origin of a bottle that he'd dug in Illinois. He wondered if it could possibly be western. I have to admit, the photos caught my interest. I also have to admit that it was one that I'd never seen. The shape of the bottle looked very familiar, but unlike any western whiskey I'd encountered. In fact, it looked like an eastern bitters that I recalled seeing quite some time ago, but who's name I couldn't recall. Still; Elk's Pride Whiskey sure was a catchy handle. A little research into the whiskey brand data base revealed two strong contenders for the origin of said "Pride". One was J.S. Low of Carlisle Pa., the other, Adolph Harris of S.F. Cal. 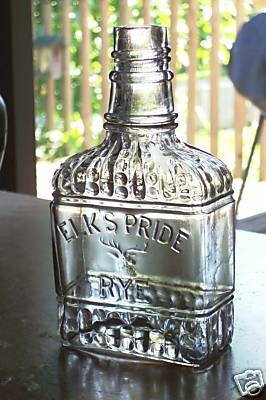 Some online sleuthing revealed a very similar bottle, identical in appearance but embossed Elk's Pride Rye. It appeared to be a 5 3/4" mini with externally blown threads and with the same stag embossed on the obverse as on the "Whiskey". It was also a rectangle with the same decorative treatment and logic says that it had to come from the same outfit. Interesting too, was that it was also dug in Illinois. 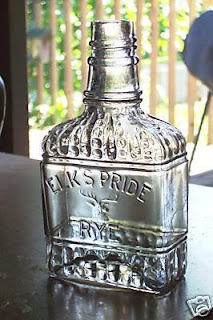 I then compared the amber Adolph Harris in my collection with the Elk's Pride bottles. It was evident that the antlers on the A.H. were very typically western in form; nearly erect, whereas the Elk' prides were more horizontal in style and more in keeping with the eastern renditions of stags that I've seen. Still later, I came across a photo of a pottery jug from the aforementioned J.S. Low of Carlisle Pa. 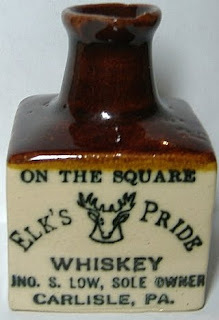 It clearly depicts a stag along with the words Elks Pride Whiskey. I promised the owner of the bottle to solicit coments from the general western whiskey arena. So; is it eastern or western? Feel free to weigh in with your ideas.